And how wonderful is this list?! 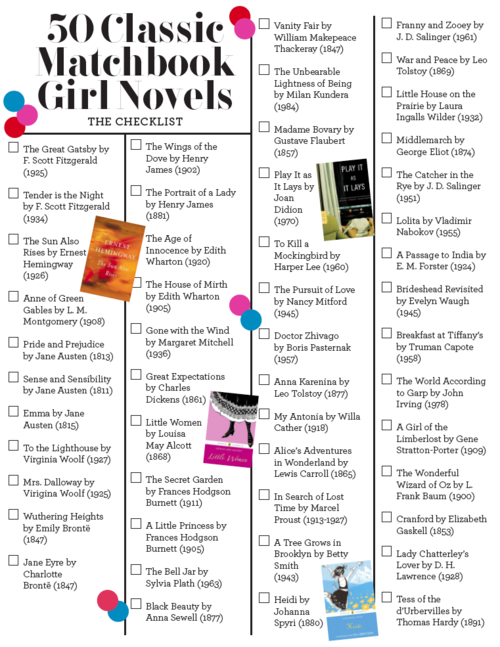 How many have you knocked off (Nabokov?!)? (From the February 2012 edition – click to make larger) I adore that Heidi and Madame Bovary appear together. 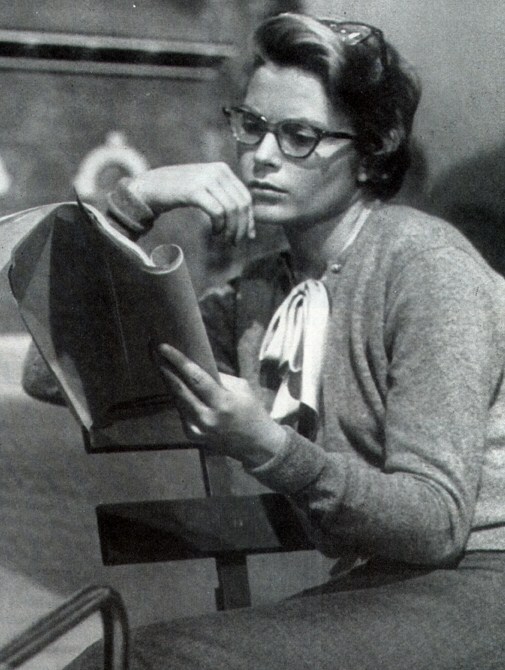 I’m finding myself assessing women characters in my reading as to whether they’d be considered a “Matchbook Girl” or not. Recently finished Rules of Civility by Amor Towles and believe Katey Kontent may just qualify. 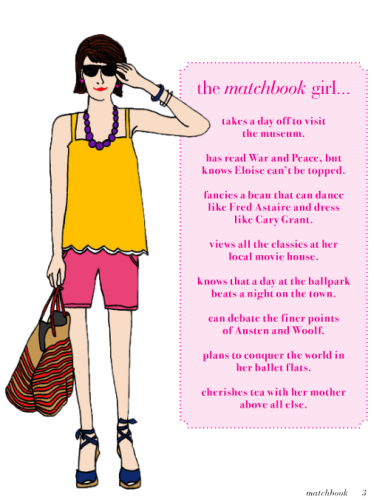 Matchbook Magazine feels like a Spring Day unto itself – hope you can make time to become acquainted as your Spring arrives. For entertaining insight into the behind the scenes development of not only a magazine, but one of these iconic issues, view The September Issue. This documentary follows Anna Wintour, Editor-in-Chief of American Vogue, during the entire process. View the trailer here and then plan to hoist a big September issue onto your lap and snuggle up to watch the DVD on a cool late summer evening. 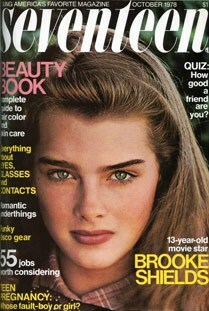 Magazines, as we’ve discussed before, are another form of reading entertainment many of us enjoy. I’ve always appreciated magazines for the dose of colour and creativity – it’s fun to be inspired by the work of others be it in home or fashion design, travel, art, writing, philanthropy or even sport. I’ve not gone the way of an e-reader (yet) but those I know who’ve braved that world are particularly fond of the way magazines can be read on the device. (It appears the ipad dominates this market.) 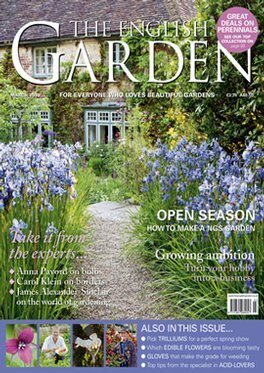 I’ve recently discovered a growing number of magazines that are available free of charge or by donation for reading primarily on-line, some without any print presence at all. These work quite well on a computer screen and seem to be the new direction for magazines in general. A unique feature of on-line magazine reading is that should you be interested in learning more about a product, service or person shown, a link is often embedded so you can be taken straight to the specific webpage. Hints as you get underway: Full Screen mode viewing is best – just select that option from the task bar. If the print is too fine or small, enlarge the text. Subscribe to receive the newest edition when it’s available or Bookmark the site. Don’t forget to check the archives for back-issues as well. 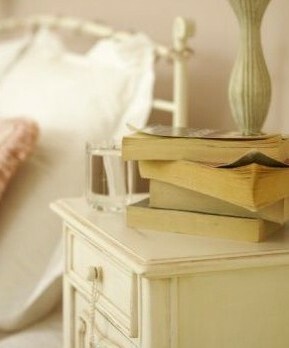 Just think – no teetering piles of slippery outdated magazines vying for space with your precious books! Have fun and let us know if you’re a convert to reading magazines on-line. Click on the photos of each magazine cover below to be taken to their site where you can try reading on-line. Covet Garden – Inspiration Grows Here. ” We started Covet Garden because we wanted to see a magazine that made us feel as though we were invited into someone’s home. And then, once they let us in, we started snooping around and got to know them a bit better.” Canadian and unique in that it features one creative person or team each month. Short and sweet and “inspiring – not aspiring“! And two from Australia … when you need a little spring inspiration during our dreary autumn! Adore Home – Another youthful, colourful and fun magazine, featuring design, decor and travel. If you love trivia and good wit you’ll love this! A great Father’s Day gift too. 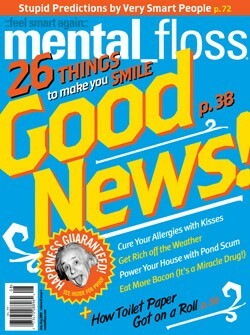 On the website they answer the question: What is mental floss magazine? Not always easy to find this one in our town but worth hunting for – absolutely scrumptious photography and inspiring articles about creative and entrepreneurial folk. 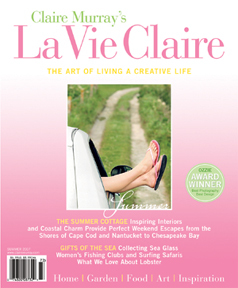 They describe themselves at La Vie Claire as: Celebrating the art of living a creative life with passion, purpose, and inspiration. With beautiful photography of extraordinary places, La Vie Claire invites you to escape. It’s a special treat to splurge on occasion and venture into the international section of the rack. You may spend a bit more but I assure you that you’ll find exciting new ideas and images based on refreshingly different sensibilities: recipes, gardens, entrepreneurial ventures, fashion, essays, decor, travel, shops and yes, even reading recommendations. 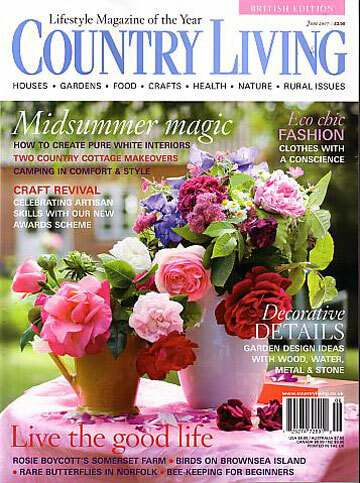 Country Living – UK edition has stunning photos as well that will make you feel like you’ve traveled through the English countryside yourself. My garden may never strike even a faint resemblance to the gardens featured in The English Garden but a gal can dream! Leave the UK and head south to France and any of the Cote Maison series (Cote Sud or Cote Ouest/Est and Cote Paris) A little European vacation … you’ll be so inspired! 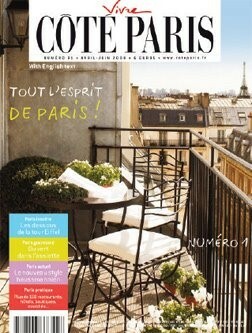 The summer season prompts many magazines to publish special editions. Business might not be your first pick at the beach but take a peek at Fast Company and its 100 Most Creative People in Business edition or Entrepreneur magazine’s 100 Brilliant Ideas issue. You may pick up your magazines at the grocery store or pharmacy check-out but if you want a perfect rainy day adventure and you are in Vancouver head to Does Your Mother Know? magazine mecca in Kitsilano at 2139 West 4th Ave just west of Arbutus Street. You will not believe the variety! Don’t be intimidated by the shop’s name – it’s a bit odd and has no doubt intimidated a few meek souls fearing the worst. The neighbouring shop is Readerwear which sells nothing but reading glasses so if your eyes are dim and you cannot see you won’t be adrift in the magazine shop.